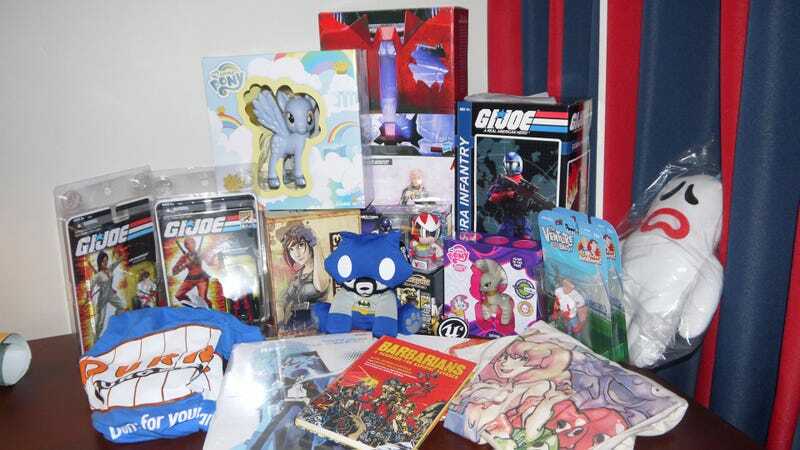 On the second day of Comic-Con my true love let me buy... a ton of relatively useless but shiny and pretty things. You may have survived day one but nothing can prepare you for Comic-Con Swag Day Two: The Swaggening. My budget has been met, and exceeded by no small amount. I blame everyone else but myself for this, because I am a firm believer in delegating responsibility. Is it my fault the Skelanimals people struck a deal with DC Comics to dress up plushies as super heroes? If it was, I am not seeing any of that money. I might sue. That wasn't so bad, right? Completely reasonable purchases, every one. No one could fault me. No one reasonable and attractive. Today is my third and final day at Comic-Con, and I can't see myself spending too much more on stuff.